This seems to be a story about healing, about God’s graciousness in healing the illnesses that come because we have turned God’s good creation into a sinful, fallen world. If so, it leads us to praise God. But, at another level, it is a story about obedience. We can understand the leper’s exuberance. He was dying of a painful disease, he was a social outcast, he could not work, and he was probably in desperate poverty. Then Jesus changed all that with a word. Jesus healed him miraculously and changed every aspect of his life for the better. Jesus told him not to tell anyone, but he couldn’t help but tell people what Jesus had done for him. We find his exuberance understandable, even commendable. People should be praising Jesus. How then do we understand Jesus’ command that he remain silent? We probably think that Jesus didn’t really mean what he said. Perhaps we think Jesus told him to be silent so that the man could demonstrate the proper exuberant attitude regarding Jesus’ healing. But does Jesus really give us commands he doesn’t mean? How far do we want to push that idea? Jesus didn’t make a suggestion. He gave the man “a strong warning.” The only possible explanation is that Jesus meant what he said. So why did Jesus want the man to be silent? Shouldn’t we tell other people about Jesus? In the first place, this command was not a general command to all of Jesus’ followers but a specific command for this man in this time and place. Generally, Jesus wants us to tell others about him. But at this time, Jesus commanded this man to remain silent. Why? Look at what happened. 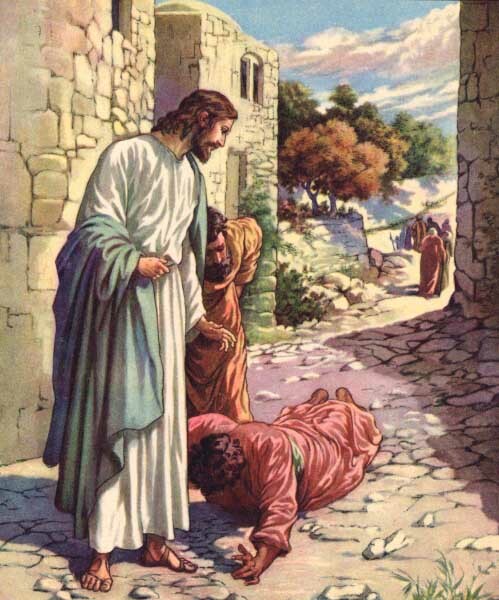 Because the man reported widely his miraculous healing, people flocked to see Jesus. This meant that Jesus was besieged by the curious and the sensation seekers and he could no longer go into the towns. It also meant that it was harder for those who were truly seeking Jesus to find him and harder for Jesus to get to them. Were other people not healed or taught because of the leper’s disobedience? The issue for us is also obedience. Jesus has given us general commands to tell other people about him, and we should obey those commands. But sometimes, at specific times, he tells us to be quiet, perhaps because the person we want to tell is not ready to hear. Are we willing to obey that command too? More generally, has Jesus ever told us to do something or not do something – and we have disobeyed because we didn’t really believe Jesus meant it? Are there times when we think we know better than Jesus? If we really are grateful for what Jesus has done for us, isn’t it best to demonstrate our gratitude by doing what Jesus wants?